The future of Liverpool Football Club's newly approved stadium and the future of Anfield's historic listed park is now to be reconsidered by American owners. According to today's Liverpool Echo, scaled down options to build on the existing public football pitches of Stanley Park will be decided in the New Year. The future of the Garden Festival Site, including the public open space along Otterspool Promenade, is the subject of a Public Inquiry which resumes on 7 January. Liverpool Council planners are recommending that Promenade land is given over for the Festival Gardens development early in the New Year. To date, no agreement has been made between the Developers, Langtree McLean, and the City Council as to the definitive boundary of the leases. Leaseholders responsible for dereliction of Garden Festival Site - Inquiry reveals. After three weeks, it is clear from the Public Inquiry that Liverpool City Council want to allow a large scale new development on the former Garden Festival site - in order to secure a new park as a legacy of 2008 to be funded by the developers Langtree McLean. As part of the scheme the tree lined Otterspool Promenade will be urbanised and dominated by 7 high-rise “finger-blocks”. Leasehold tenants of the Garden Festival site have been held responsible for the, much criticised, dereliction of the site. Agreements to control the state and maintenance of this prime site have not been enforced by the City Council, who own and lease the land. The maintenance of the leaking sea wall is another issue that has not been adequately resolved. Sea water is passing into the contaminated land-fill beneath the Festival site. Council leaders want to create a splash with a new park for 2008 and with the oriental gardens as its focus. This is not a smoke screen to conceal the fact that many other parks and green spaces in Liverpool are being lost to private building schemes but is to create a "new gateway" for the city. A new gateway to be built on treasured open green space and makes a clear statement that a culture of property speculation will be at the heart of Liverpool’s legacy for 2008. The 7 "finger-blocks” are master-planned to tower from the inner core of the development - extending through the wooded embankment towards the promenade. These blocks will have a significant physical and visual impact and with 3 stretching over what is now a public grass embankment – a spit from the coastal footpath enjoyed and loved by many. Will Liverpool's news media reflect on its support of the scheme to build "finger-blocks" to replace Merseyside's only tree lined promenade and for influencing public opinion to accept the cynical marketing strategy of developers? The 67 acre Garden Festival site is planned to be split in various parts: the Southern Grasslands, a central gated park next to 1308 high density 1 & 2 bed apartments and 7 "finger-blocks" containing 66 luxury apartments. None of the dwellings will have gardens or ground floor living spaces due to health risks of contaminated land. The Public Inquiry resumes for concluding witnesses at 10:00am on Monday 7th January at Blackburne House, off Hope Street, Liverpool. The advertised disposal of public open space along Otterspool Promenade, for the Garden Festival development, has been delayed over plans submitted by Langtree McLean which were found to be incorrect. It emerged at the Public Inquiry that three “finger-blocks” are intended to be built to cover a larger part of the promenade than plans suggest and that the City Council had been mislead by the developers as to the extent of additional public land required. Since the Inquiry recess on 16th November 07, it has been revealed that some parts of the fence around the Garden Festival site is not included in the Langtree lease and is a barrier to land that should be part of the public open space along the promenade. However Council planners are recommending that the disposal of this public land should go ahead and approved at an early Executive Board meeting in 2008 - probably on 4 or 18 January. This public promenade land is part of the grass and wooded embankment that runs along the River Mersey walkway. Otterspool Promenade starts by the Britannia Inn and continues south east adjacent to the Garden Festival site. This is currently the nearest undeveloped coastal green space (Green Wedge) to central Liverpool. On the 28 September, when the disposal of public land was discussed, at the Regeneration Select Committee the Chair's opening remarks referring to the Garden Festival Site were that "Any development on this site would be better than what has already happened over the past 20 years". For details regarding disposal of land for Festival Gardens scheme see the Council's item 4i from the 28 Sept agenda and the misleading plan for the "finger blocks" PDF. The Secretary of State decided to call in the planned scheme to re-develop Liverpool's former Garden Festival site and requested a Public Inquiry. Inquiry dates are 30 October to 16 November 2007 and resumes on 7 January 2008 at Blackburne House, Liverpool at 10am. The Secretary of State wishes to be informed about the extent to which the proposed development on the Festival site meets Government Planning Policies which includes: Delivering Sustainable Development and sustainable communities, Housing Requirements, Nature Conservation and Planning for Open Space, Sport and Recreation. It was on 1 April that about 100 people first met at Lark Lane Community Centre to voice concern about the large scale tree felling and other changes taking place in and around Liverpool's Garden Festival site. At the meeting it was agreed to establish a new Garden Festival Campaign and to formulate an action plan to protect this Green Wedge and remaining woods. 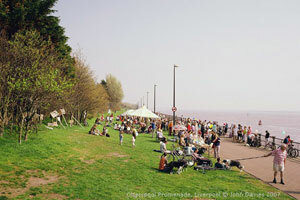 On 15 April supporters of the Garden Festival Campaign held a "protest/celebration" on Otterspool Promenade next to the Garden Festival site. Within three hours over 400 visitors signed letters of objection to LCC against the development on the site. A further 950 letters were sent to the NW local government office. Since 2004 Langtree McLean have worked closely with the Council to present the current application to build 372 one-bed apartments, 936 two-bed apartments and 66 townhouses. Since 1996 the Festival site has been closed to the public and became a flourishing unplanned nature reserve until November 2006 when contractors moved onto the site to remove the domed Hall. By March 2007 thousands of trees were felled. Many 25 year old Turkey Oak trees, a variety specially selected for a maritime climate and planted as saplings for the Festival, have been cleared in areas marked for thinning. The Council's planners have supported all the tree felling that has occurred on the site. For more details from Liverpool's Planning Committee regarding plans for the Festival site see the Printed Minutes from 21 May and also the Case Officers Report PDF, listing objections received and answers given. The Planning Committee rejected the Commission for Architecture and the Built Environment's findings that, "...the housing proposals are flawed and that the vision underpinning the development of the public park is weak." See CABE's report here. Parts of the area occupied by the Festival site and Promenade is known as the historic "Cast Iron Shore" where ships once unloaded iron ore for cast iron smelting. This industry was run by local man who lived in nearby St Michaels Hamlet where he built the famous cast-iron church. Reclaimed land from the Mersey estuary was later used for an oil storage terminal before the whole area was used for several land-fill sites for industrial, chemical and domestic waste. Substantial landscaping transformed the area into the first International Garden Festival in the UK, open to the public during 1984. The site was then leased to Wiggins and used as a commercial leisure park until about 1996. Plans to build on the site in 2001 and 2002 failed. Campaigners hold regular Wednesday open meetings at Aigburth Cricket & Bowling Club next to St. Michaels Railway Station at 6:30pm. Stadium on Stanley Park - back to the drawing board for "New Anfield"
Liverpool City Council recently agreed to plans for a £300m American style stadium to be built on the historic Stanley Park in Anfield. To seat 60,000 but for a structure to potentially seat up to 78,000. These plans are now to be reconsidered by the football club owners for a dramatically scaled down stadium. The football team manager has told club owners that £150m, half the building costs of the new stadium, is needed to invest in football players for the continued success of the club. New cost-effective architectural plans are being drawn up for a less ambitious stadium to open in 2011 - 2012. Previously agreed plans were to build a futuristic stadium stretching the length of this Victorian park and were to incorporate a Community Partnership Centre to replace the sports centre on the site. Houses on Anfield Road have already been demolished to make way for the new stadium. Agreed plans also include changes to the remainder of Stanley Park - see next item. There is also an outline planning application for the redevelopment of the current Anfield ground to be replaced by a hotel, offices, shops, community uses, houses and a small open space. It is the Council's intention to sell the existing stadium land to LFC for £2.5 M.
Revised designs for Liverpool's £300m football stadium, New Anfield, were unveiled on 25 July along with submissions of planning applications to the Council. Further expansion for up to 78,000 seats has always been dependent on improvements to the local transport infrastructure - namely building a local railway station on an existing line. It is planned that "Stadco" will become the new company set up by LFC to lease the park land from the City for 999 years for an initial rent of £300,000 pa. - the going rate for a brown-field site of this size in Liverpool. Many of the houses between Stanley Park and the area surrounding the existing football stadium are being emptied and demolished under Compulsive Purchase Orders for "Regeneration". Reported widely in the national press on 6 February was the news that funding for the stadium was secured by the take-over of Liverpool Football Club. The Friends of Stanley Park oppose the commercial development on the public open space of Stanley Park. The plans for the new stadium site will have an impact on the rest of Stanley Park and includes leveling large areas of the remaining park with landfill. Plans also involve creating new straight pathways and clearing trees to help control the flow of football fans. LCC's Planning Committee met on 28 September and have recommended the go-ahead for the restoration of Stanley Park and the re-construction of Gladstone Conservatory / Palm House. At the meeting the Chairman of the Friends of Stanley Park objected to being cut short in presenting their case for amendments to the restorations. These restorations are also funded by Objective 1 and there will be some urgency to complete as much of the work as possible before the December 2008 funding deadline. Details of the plans for Stanley Park can be found in item 138 from the 28 September Planning Committee. Liverpool's Executive Board agreed that the regeneration and restoration of Stanley Park is interlinked with a Joint Venture Company agreement between Liverpool Football Club and the Council. Because of this new agreement and delays with plans for a new stadium it now means that part of the £5 M. European Objective 1 funds, allocated for park restorations, will be lost. The Objective 1 fund has to be spent and activity completed by December 2008. LFC will manage security and CCTV surveillance around the stadium, the Conservatory and the rest of the park. Compass Contract Services have been invited to make proposals to run the Conservatory as a catering facility. Previous plans to include a visitor's Centre appear to have been dropped. A new proposed sub-committee consisting of representatives from LCC, LFC and Anfield Breckfield Partnership Forum will consider how the restored park and open spaces of the Anfield Plaza will best serve the community and regeneration. Previous plans to restore the park with £7 M. funding from English Heritage was withdrawn after the Council gave planning permission to build a stadium on the park. For a history of Stanley Park see The Anfield Voice - park page. The Friends of Stanley Park hold open public meetings on the third Wednesday in every month (except on match days and then meet on the following day) at the Hillsborough Lodge also known as the Visitor's Centre, on Anfield Road near the Palm House at 7:30pm. Plans to develop Millbank Playing Fields for a new school building was discussed by Liverpool's planning Committee on 18 September. The site, allocated as Green Space, lies between West Derby Lane and Bankfield Road and includes the Peter Lloyd Leisure Centre and car park. This is an outline application seeking to establish the principle of the development on the site only. On the 14 May 07 the application was considered by Anfield, Tuebrook and Stoneycroft Neighbourhood Committee which agreed that the use of playing fields was totally unacceptable in this densely populated area. For full details see the Case Officer's Report. The Friends of Sefton Park are concerned about the current tree felling proposals in the park. They are also concerned about the apparent breakdown in the consultation process with the Council and the planners. As part of a consultation process the last meeting was held on 3 February which included planners, stake-holders and Friends of Sefton Park. The Friends were responsible for the initial proposals which lead to a £4.8M English Heritage grant to revitalise the park. Major renovation work is due to start in the park later this year and is scheduled for completion in 2009. Designs and notices of the changes can be seen inside the Aviary Café situated in the centre of Sefton park. The café and the area around it will also be re-developed. See the Council's Sefton Park web page for the Spring issue of their "quarterly" newsletter. The Friends meet regularly at the Old Police Station on Lark Lane. The Friends of Walton Hall Park Committee embrace a wide range of user groups within the park as well as inviting various professional bodies to help improve and maintain the park's facilities for the wider community. The meeting on 27 July was attended by representatives from: Council staff from both Parks and Sports, Liverpool's two angling clubs, Liverpool Loop Line and the Liverpool Charity & Voluntary Services (LCVS). A representative from Liverpool Loop Line, part of the National Cycle Network near the Park, was concerned by the large amount of rubbish tipping on the cycle path by local residents. A representative from LCVS invited local groups within the Ebb Valley to apply to his organisation for grant aid to help finance community projects concerned with general environmental improvements in the area. The Friends meet in the park's Sports Centre and all who live within 3 miles of the park are welcome to attend - meetings are normally held on the last Friday in the month. The 3rd Liverpool Parks Friends Forum, with representatives from "Friends of Parks", was held at Croxteth Hall on 9 June. The meeting started with an introduction of Liverpool's "Park Strategy" given by Council Officers. This document was adopted by the Council last autumn and is expected to be published later this year after various scrutiny meetings. One of the key headline themes of the strategy is community involvement and to "respond to the concerns and needs of the citizens of Liverpool and visitors". To help facilitate community involvement the Council set up the "Friends of Parks" forum group at the end of last year. At the meeting a structure for a "Liverpool Parks Friends Forum" board was finalised based on electing two representatives from each of the five neighbourhood areas within Liverpool. Future forum and board meetings will now be independent of the Council but Officers agreed to help facilitate these meetings. Before the end of the meeting each of the neighbourhood representatives were asked to list both good and bad characteristics of parks within their areas. The majority of complaints were concerned with vandalism, under-age drinking and drug taking. Other negative points were more specific to different areas and included: taking public park land for private building projects, problems with Glendales (the contractors for maintaining parks) including a lack of adequate tree planting to replace felled trees, a lack of information about funds or fund raising and a lack of information about other "Friends" groups. On the positive side, most all areas reported various community and cultural events taking place in parks this summer. Other good points were specific to different areas and included the successful "Hooked on Fishing" kid's scheme and various sporting facilities available in some parks. 2005 draft Park Strategy PDF. The Commons Act 2006 changes the legal definition of a town or village green. This came into force on 6 April 2007 and sets out the qualifying circumstances in which land may be newly registered - click here for more details from the DEFRA web site page. The Friends of Princes Park have recently been given a grant from "Awards for All" to help involve local people with the park - news on plans to follow. The Dixie Dean Playing Fields in Everton has been at the centre of a recent public inquiry. An application to register the Playing Fields as a Town or Village Green was opposed by Liverpool City Council. Dixie Dean is the proposed site for the North Liverpool Academy. The inquiry's inspector recommended that the Council does not register Dixie Dean as a Town or Village Green under existing law* The inspector also concluded that renting pitches to amateur football teams was inconsistent and incompatible with the Council's assertion that the playing fields were "of public usage as of right". That is, until the Council transferred the land for educational use in 2004. The playing fields have been regularly used by amateur football teams from the 1970s to 2007. The full report was published on 8 February and can be downloaded here: Dixie Dean Public Enquiry Report (PDF). During the enquiry it was noted (but not published in the Report) that the allocated annual budget for picking up litter once a week from this 4 hectare site was £17,000. All of the inspector's recommendations were fully accepted by the Council's Environment Regulatory Committee meeting on 16 February. *The Commons Act 2006 changes the legal definition of a town or village green, see DEFRA web site. At the beginning of 2007 the remainder of Speke Park disappeared. Speke Park was a large District Park and originally conceived as the centre-piece for the 1950's Speke housing estate. In 2002 over half of this central park became England's first regeneration Private Finance Initiative (PFI) which included a leisure sports complex (built around an original swimming pool) and "Parklands" the relocation of the library and community centre along with a new school. A feature of the remaining park had been a substantial hill left over from the PFI excavations. In 2006 work started to remove the hill along with four rows of nearby apartment blocks. These were leveled to make way for the development of a supermarket and retail park with a link road to the A561. By 2007 the area had became a construction site and all signs of Speke Park had disappeared apart from some original cast-iron perimeter fencing. The only other comparable accessible open space serving this densely populated area of about 10,000 people had been a stretch of Playing Fields situated between the housing estate and the newly built airport. The Playing Fields were fenced off in 2005 and became part of Liverpool Airport's facilities. Across the road from the site of Speke Park is the Parade, originally planned as a central shopping area for Speke housing estate with a range of community facilities. A number of these services have already been transferred to "Parklands". Once the Speke retail park is complete it is likely that the Parade will be demolished. All the photographs on this site are by John Davies and is "work in progress". This selection of images remains fluid and changes regularly. John Davies is also making a series of portraits of people but these are not available on the internet.